If you work in the system with multiple users or tend to open several screens at a time you may run into a loop of error messages as you try to add, change, or edit something in a journal. Read on to find out what the messages mean and how to get them to go away so you can continue working (and prevent them from occurring in the future). Do the following loop of error messages look familiar to you? If so, then what’s important is identifying which type of error (out of the two possibilities) you are receiving. To troubleshoot the cause of the error, you should click "OK" on image 1, which then brings you to image 2. From here press the highlighted arrow that is shown on image 2, which will take you to one of the following two screens that provides the reason for your session being locked. When it reads “Record already locked by this session,” it tells us that you (the user) are trying to edit the same transaction twice. You essentially have locked yourself out. When you are attempting to edit a transaction that is already open, the system doesn’t know where to look. To get yourself unlocked, you must log out completely by using the start menu at the bottom left hand corner. This is the only way to log off of the server completely (see our previous blog post “How to Properly Log Off the PROCAS Server, and the Benefits of Doing it Properly”). Hitting either of the “X’s” at the top of the screen will not work, as it just disconnects you for the time being. Once you get logged back in, the transaction you were editing may or may not have saved your changes. We have found in most cases that the journal is left how it was, and it may be sitting out of balance. If it reads “File is locked” then this tells us that a different user has the same transaction open. Line two of the message on image 4 will let you know which user is attempting to edit the same entry. In this case, logging out wont fix the issue. To get unlocked you will need to have the user listed on the screen close down the window you are trying to access. So in this instance, I would ask “smartin,” the user listed on image 4, to close the window that is locking me up, as we both shouldn’t be editing the same entry at the same time. Once they have finished what they are doing and have closed their window, you shouldn’t have a problem accessing the journal. The PROCAS team is ecstatic to announce that our Time & Expense system has received an update! We have added several features that will make using the system significantly easier and more efficient for you and your employees. The addition of these items to the “Administration” section will save you precious time and improve the overall efficiency of our Time & Expense system. Employees are no longer the only ones who can choose which charge codes show up on their timesheets by default. Admins are now able to establish the codes and it can be done either by person or by task. Another great feature being added is a default charge code capacity of 100. This ensures the timesheet rendering runs smoothly every time. This new function works best when you add a new employee to your staff. It makes it much simpler for onboarding the new member. From this screen, you’re able to select which employee you’d like to choose the default codes for using the “Employee:” drop down menu. You are even able to sort the employees by approval group if needed. Note: As you check/uncheck the charge codes, the “Total Selected:” counter will increase/decrease accordingly. Once you go over the 100 charge code limit, the counter will turn red, and the warning message, shown below, will appear. 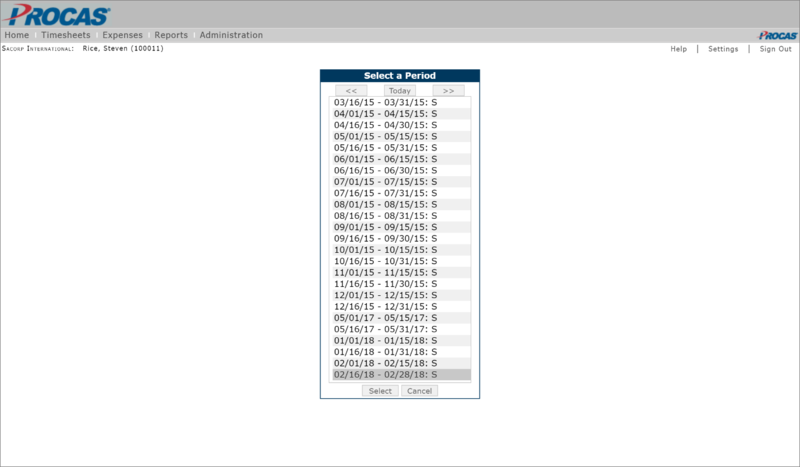 You will not be able to save the changes you’ve made to the employee’s charge codes until you return to a selection under the capacity. A “Save successful” message will appear on the top of the page if performed correctly. Establishing default codes by task works very similar to by person, but it allows you to select codes for multiple employees at a time. This function can be best utilized when you receive a new contact and have new tasks that apply to a portion of your staff. It also works great for the end of the year when it’s time to update your Holiday and PTO task numbers for tracking. 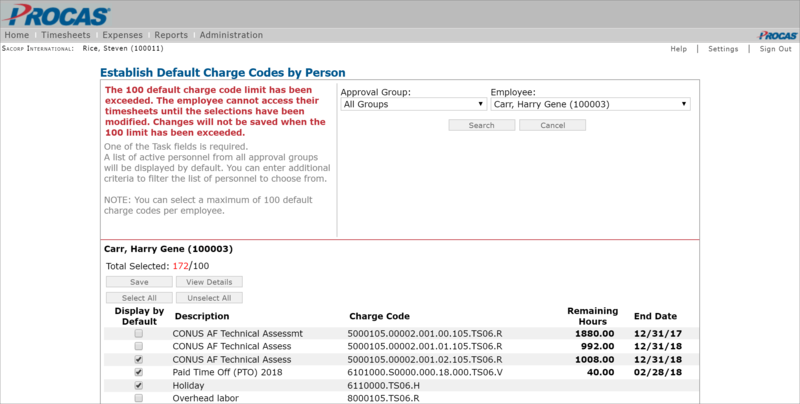 Once you’ve selected the “Establish Default Charge Codes (By Task)” function, you will see a set of parameters you can set to search for tasks and employees. Input the search criteria you desire and press “Search.” A list of charge codes and employees will be generated and codes can be selected. By clicking on the black, “here” you can see which employees are over the code capacity. Be aware, the system will let you save these changes even with employees over the limit. However, when the employees who are over the limit log in, they will be automatically directed to their “Establish Default Chare Codes” screen and must update their selections before they can access their timesheets. Over the years, computer screens have been getting larger and larger. The new update is taking that into account and will save you from scrolling through long lists of dates. The “Select a Period” window has now been expanded from six periods shown at a time to 25. Ever run into the issue of forgetting if a timesheet period has been exported into the accounting software? Now, when you go into the “Export Timesheets by Period to Accounting System” tab, you will know. 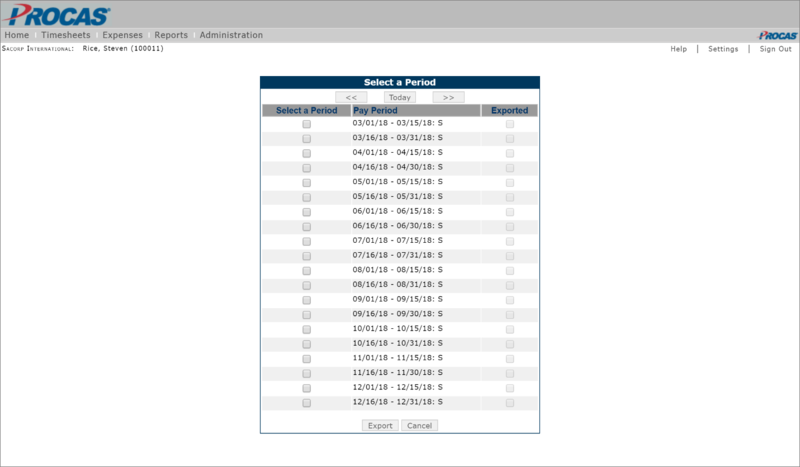 The previous periods will all appear and you will now see (non-editable) check boxes labeled as “exported” next to the periods that have already been sent over to the accounting system. We hope these updates to our Time & Expense system will make your jobs just that much easier. If you run into any issues or have any questions about the changes, feel free to contact us between 9AM and 5PM EST, and a member of our dedicated support team will be happy to help.